Christmas, the celebration of the birth of Jesus is a wonderful time of year. Christmas celebration means lights, snow, Carols, feelings of warmth and togetherness, sharing memories and most of all, the feeling of giving. People enjoy this festival with lots of love and enjoy the cherish of Christmas with sweets and gifts. Every country is having a unique way of observing Christmas, but certain cultures are the same throughout the world people exchange gifts and sweets, decorate their houses and illuminate it with light, decoration and Christmas trees. In India, Christmas Day is joyfully celebrated by people of all religions together with their Christian friends. Christmas called 'Bada Din' in Hindi means the Big day is a national holiday in India. The celebration begins on the eve of Christmas on 24th of December and continues till New Year's Day. Christians across the country mark the birth of Jesus Christ on Christmas Day by participating in special masses organized in churches. Celebrating Christmas is all about giving and bestowing your blessings. Christmas is also a time when people would like to treat loved ones with gifts. Christmas gifts giving to relatives was begun since the three wise men present gifts to Jesus Christ. People give gifts to their near and dear ones and friends and family to share emotional feelings with each other and exchange happiness and prosperity in the form of nice gifts. That's why Christmas festival represents the perfect reason to indulge in shopping for self as well as family members and friends. One should plan and make up their mind before they go and shop for that perfect gift. The most important thing to consider is taking care of the taste of the person when you are looking out to find a gift for someone special in your life. Because choices are many you just need to find the apt one for the person. It’s not about how expensive your gift is, but rather the feeling and care you put into the present. When it comes to choosing the perfect present, what better way to celebrate than with a wonderful piece of jewelry! Delight the special ones in your life with a special piece of jewellery that they’ll treasure forever. Kollam Supreme One gram designer Jewellery shops in Kerala and Coimbatore has many trendy and latest jewelry designs collection for this Christmas occasion which can be a perfect gift for yourself or your loved ones. 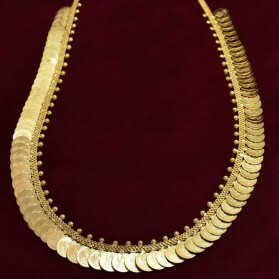 Kollam Supreme is the famous and oldest brand name for one gram and Gold covering jewellery in Kerala. We have around 36 shops at Kerala and Coimbatore in India and Sharjah and Dubai in UAE. Through our website kollamsupremeonline.com, we reach and satisfy our customers all around the globe who want to buy Modern, Contemporary or classic designs with an ethnic Indian touch. Online shopping made life very easy today. In this busy world, people don't want to waste their time in traffic and market right before and on Christmas eve because they get better products on their doorstep. Kollam Supreme has many trendy and latest Jewellery collection for Christmas 2018. Premium Fashion Pendant Sets, Necklaces, Bracelets, Bangles, Chains and anklets in various designs and styles available in our offline and online stores. Kollam supreme also sells through other online web portals like Amazon, Flipkart, Paytm... You can find anything from casual jewellery to bridal jewellery in all online marketplaces. Jewellery is the way that women used to express themselves. So whether a Christmas gift you're looking for or something to wear yourself throughout the festive period kollamsupremeonline.com is the online artificial jewellery shopping website where one can buy jewellery at the lowest price. Here are some ideas to help you out a deal with the difficulty of finding an apt Christmas gift for all the people in your life. There are different preferences for all age groups. Give a gift they'll never forget with our range of beautiful jewellery, dazzling American diamonds and Ruby ornaments. Show your friendship with bracelets, earrings, necklaces and more from Kollam Supreme. Jewellery is a girl’s best friend. This Christmas, gift her the piece of jewellery which make her happier when wearing. Look out our latest trends and our most-wanted fashion pieces, for a gift that will make her happy. What better way to let your wife or girlfriend document your life together than with a Semi-precious Ruby stone Necklace Set? It comes in a wide variety of designs and different stones so you can pick her favourite. Find the right jewellery for your mom, their choice might not be like yours but you know better what she likes. Give her a nice Studs or Simple chain she can use every day. 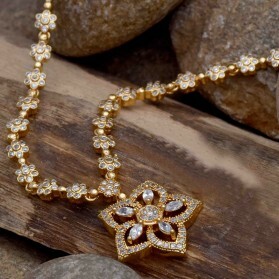 For an aged Mom, a classic Piece of jewellery with an ethnic touch will be perfect. White gold plated floral Pendant set with dazzling big American Diamond Finger Ring is a perfect Christmas gift for our trendy sisters. A simple hanging Bracelet for light up her wrist or Silver-tone Fancy Anklets is also a good choice to bring a smile on her lips. Actually, there is a long list of gifts for the teenager!! They love Pendants, Bangles, Earrings, Chains, Bracelets which they can wear to school or college daily. But they like something look expensive on special occasions. Semi-Precious Ruby Emerald Earrings will be one of the perfect gifts for Christmas for teens. The small chunks of people you work with become actually an important part of your life and if it's a celebration like Christmas, you will definitely love giving them some wonderful gifts. Here you can take an idea about a gift for Ladies and gents. You can gift female co-workers a piece of beautiful jewellery that they will love to wear daily to the office. 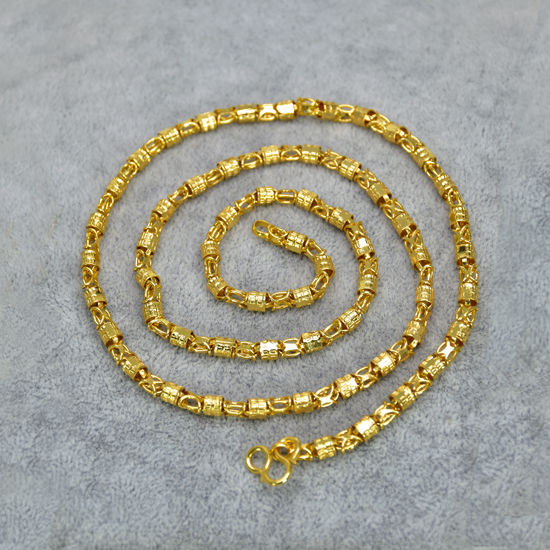 As per their taste you can gift them a nice Chain, Earrings, stacking bangles or Pendant sets. Kids are really very much excited about Christmas day celebration and that is because they believe that it's time for them to receive gifts. Here are some ideas that can make kids happy and joyous this Christmas. Kids mostly love sweets and toys as a gift on all occasions. But to girls, you can gift fashion jewellery. They will love that because girls on any age love ornaments more than anything else. A combo pack of Bangle, chain and earrings or daily wear fashion necklace set or their favourite cartoon characters studs to wear daily to school will do!! Also, you can make them happy by gifting beautiful Kids anklets or Pendants. On Christmas, one can present a very personal gift to make a special memory for someone you love. If looking for a jewellery gift idea for him Kollam Supreme have a collection for men. You’ll find bracelets, Chains, rings, designer Kada made of top quality materials like brass and Silver in classic and elegant designs for everyday life. Get your father a thick Gent's Bracelet or Chain this Christmas so he can celebrate the holidays in style. A jewellery for a brother? That may not be cool stuff for all boys. But if your brother is that kind of modern person who loves to wear stud on an ear, a wire on hand or as chains you can give a jewellery gift which make him happy. He’ll surely smile when he sees a fresh pair of thin studs, Silver chain, a thick bracelet, Kada or finger ring in his size. A Christmas gift can bring a lot of love and prosperity because gifting is done with all their heart and soul. Enjoy this Christmas together with family and friends with a new gift and make this X'mas a memorable, unique and delighted. 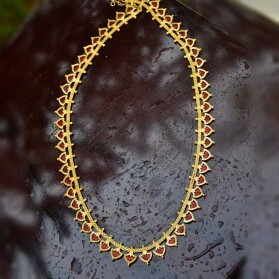 Gorgeous gold Plated Aiswarya Chain with Ruby American Diamond One side Mugappu/Pendant. With its stylish and trendy design, both women and teenagers will like to wear this. It can be used as Party & Daily Wear. Avoid chemicals and perfumes directly or indirectly. While unused please maintain inside an airtight plastic box or cover for long colour life. These Beautiful Gold Plated American Diamond Bangles with unique designs and patterns are in trend and cherished by women. 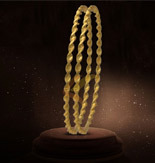 This unique type of gold plated bangles with simple and classic design studded with American diamond that will meet the requirement of traditional as well as trendy attire. This appealing beautiful one gram gold necklace set is studded with high-quality shining CZ Diamonds, Ruby Stones and adorned with Pearls. Jumka model pendant and matching earrings have beautiful butterfly design and pearls. Perfect for Marriage, engagements and Party and it is an excellent gift for women on special occasions. 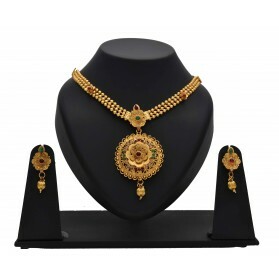 Glorious one gram gold Necklace set is finely studded with semi-precious stones. 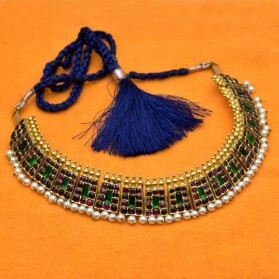 You will feel like a beautiful princess whenever you wear this delicately crafted neck piece. Wear it with Indian formal attire on special occasions and Marriage functions to make you feel feminine and graceful.